Jordan Ingram reporting for FishDuck.com from the NCAA Regionals at Howe Field in Eugene, Ore. The Ducks never looked back after Hailey Decker’s two run home run. For the No. 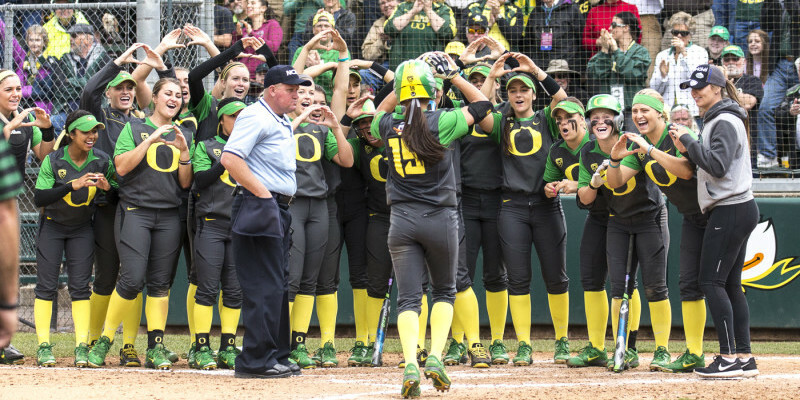 1 Oregon Ducks softball team, the road to the Women’s College World Series began in Eugene. 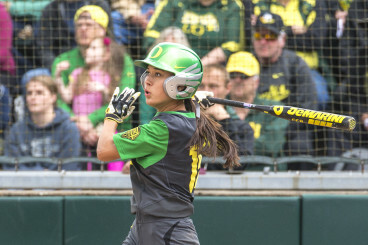 The Ducks (49-6) secured their sixth Super Regional appearance with a 6-1 victory over No. 25 North Dakota State in the NCAA Eugene Regional final Saturday at Howe Field. The Ducks are 18-0 in NCAA Regional games under Oregon head coach Mike White. Hovinga dominated the Bison from the circle. 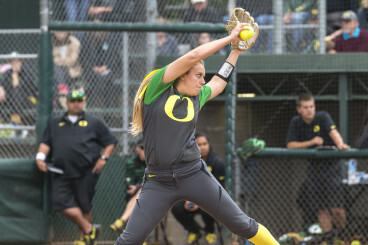 Oregon reliever Karissa Hovinga took the circle for the Ducks, allowing Cheridan Hawkins to rest most of the game. Hovinga (11-1) pitched a shutout through six innings, allowing only two hits in her razor-sharp postseason debut. NDSU senior Krista Menke (34-6) pitched all seven innings, allowing nine hits and six runs in her second straight loss to the Ducks. Hailey Decker got things rolling in the 1st inning with a two-run homer on the first pitch to give the Ducks a 2-0 lead. “I wasn’t thinking too much, just trying to drive a run in and it ended up going out,” Decker said. Takeda capped off the day with a home run as Oregon moves on to the Super Regionals. In the third inning, Janie Takeda‘s single and a Jenna Lilley walk put Oregon in scoring position. Janelle Lindvall capitalized with an RBI single to right center and the Ducks went up 3-0. In the fifth, Menke started to unravel, hitting J. Lindvall with a pitch and walking Koral Costa to put runners on first and second. Freshman Lauren Lindvall knocked a two RBI double to left field that put the Ducks up, 5-0. Takeda’s solo home run in the 6th inning gave the Ducks their final score, 6-1. The Bisons’ only unearned run resulted from a fielding error in the 7th inning. 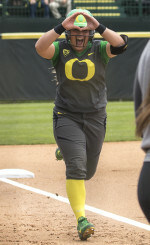 Hawkins was named the Eugene Regionals MVP and made the All-Regional Team along with teammates Decker, Nikki Udria, Takeda, Koral Costa & Lilley. The Ducks will play the winner of the Harrisonburg Regional in a best-of-three series next week and the final series of games at Howe Field.